Louis Vuitton is a French fashion brand founded in 1854 by Louis Vuitton, originally a trunk-maker to Empress Eugénie de Montijo, wife of Napoleon III. 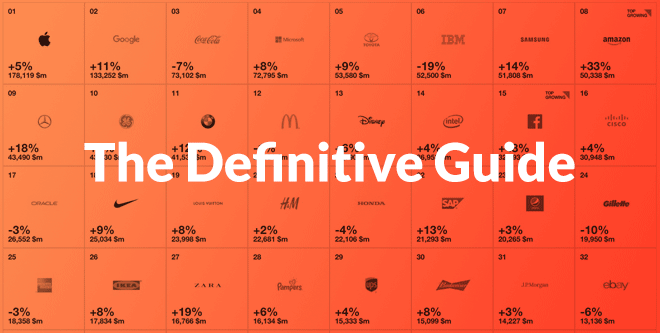 Today the brand is valued at $33.6 billion and operates in 50 countries with over 460 stores. Louis Vuitton products are some of the most counterfeited products in the world despite the company holding important trademarks and copyright protection to their logos and designs. Before the famous LV monogram was invented, Louis Vuitton became well known because it produced a stackable trunk in an era when most travel trunks were of a rounded design that made them impossible to put on top of each other. When the company passed onto his son after his death, Georges Vuitton helped pioneer the creation of the now iconic logo to help protect the company from rampant counterfeiting. By creating a logo with a unique look that was trademarkable, would-be copiers could be stopped by the force of government. When the Louis Vuitton logo was first designed it was based on a sub-trend within the Victorian Era called mon. Mon originates from Japan is a style of design often associated with representing families and high-status organizations. They are similar to how the West views family crests. During the Victorian era, Japan was viewed as an exotic land full of mystique. Designing a logo with cues from this foreign aesthetic imbued Louis Vuitton’s brand image with a certain level of luxuriousness, mystery, and class. All of these elements are things one would want to convey when selling a high-end luxury product. Looking like everyone else would have been a death sentence. Hermès was founded in 1837 as a French luxury goods manufacturer. Their primary product line was horse harnesses and bridles for the carriages of the upper classes. Over the course of the company’s existence, it weathered ups and downs as market demands and consumer tastes changed. Today though, Hermès is Forbes 15th most valuable brand with a $15.3 billion valuation. Its current brand image didn’t appear until after World War II in the 1950s. The Hermès logo was created after World War II. It is a direct nod to the company’s roots as a carriage accessories manufacturer for the aristocracy. As a luxury goods brand, the symbolism is pretty direct in that it wants its consumer to associate its natural-sourced products with high class, wealth, sophistication, and attention to detail. The reason for the bold orange might seem like a purposeful design decision in this day and age. It is so bold it had to be chosen to stand out from the competition. Instead, though, the design decision was forced upon the company by post World War II shortages that made their original color impossible. Gucci was founded in 1921 by Guccio Gucci when he was in his late 40’s. His father was an Italian leather worker and originally he wanted nothing to do with the family business. During his early life, Guccio left Italy and worked odd jobs abroad in London and Paris. While he was a lift attendant at the famous Savoy Hotel, he interacted with countless wealthy and famous individuals. He came to know their styles of dress and accessories very well during this time. He noticed in particular that these people had some of the most unique and interesting luggage designs. It is thought that this lead to his inspiration to finally take up the family business when he returned to Italy in his 40’s and create his personal brand. Guccio went on to design luggage pieces, handbags, shoes, and many more fashion accessories. He became known for an incredible level of quality and craftsmanship. Guccio’s products have been seen on many wealthy individuals and celebrities over the years and this has helped reinforce the high profile status and luxurious image of Gucci. It is also rated as Italy’s highest selling fashion brand and valued currently at $14.9 billion. Even though Gucci was formed in 1921, it wasn’t until 1933 that it got its now world famous brand logo. With the help of his son, Aldo Gucci, the double G emblem was created as a way to symbolize Guccio Gucci’s name. By itself, the logo doesn’t elicit any particular emotional response. However, over time as the brand’s products have been used by countless celebrities and seen all over modern media, the logo is now something people think of when they think of wealth, class, and luxury. Cartier was founded in Paris, France by Louis-François Cartier in 1847. It wasn’t until the 3rd generation of his family took over the company that his three grandsons went on to build the company into the world-renowned brand it is today. Cartier is one of the most famous jewelry manufacturers in the world with some of its most distinguished customers coming from royalty. King Edward VII of Great Britain is said to have called Cartier, “the jeweler of kings and the king of jewelers.” Along with these powerful connections, Cartier dedicated itself to creating some of the most unique and exotic watch designs and mechanisms. Today, Cartier is a conglomerate that designs, manufactures, distributes, and sells jewelry and watches. The brand is valued at $10.6 billion. The true origin of the Cartier logo is unknown. It is believed to have emerged in the early 20th century. With an early connection to royalty, wealth, and power it is easy to understand the stylistic decisions behind this brand’s logo design. By using a clean serif font with an elegant cursive style flow between each character the logo instantly communicates that Cartier is a refind and sophisticated brand. The use of negative space and no other artistic elements forces the eye to be drawn to the name, further suggesting the importance and grandeur of the products produced by Cartier. Rolex was founded in 1905, but it wasn’t originally called Rolex. It was named Wilsdorf and Davis after its co-founds Alfred Davis and his brother-in-law Hans Wilsdorf. Their business initially focused on importing watch mechanisms and placing them in cases made by other companies. These watches were then sold to other jewelry companies who put their own brand name on them. Essentially, Rolex started as a private label wholesaler. They grew from these humble beginnings into one of the world’s most valuable and well-known watchmakers. By 1908, the actual “Rolex” name was trademarked by the company and this set the stage for their growth. Rolex went onto achieve and receive recognition for many innovations that gave them clear competitive advantages. 1926 – Invented the first waterproof wristwatch, Rolex Oyster. The logo is built around the name itself, which was chosen specifically by the owners since they thought it was easy to pronounce in any language and sounded like the winding of a watch when you say the name out loud. They also took into account that they wanted a brand name that would be easy to read when the mark was displayed on their actual watches. The crown connects to the company’s motto, “A Crown for Every Achievement”. This symbol harkens back to its illustrious history of innovation, quality, and the long list of firsts in the world of watches. The green and gold color palette further reinforces the ideas of wealth and prestige. Chanel is a French fashion company founded in 1909 by Gabrielle Chanel also known as Coco Chanel. The company originally designed and sold hats to the wives and mistresses of the wealthy. Her original business location was in the same flat as Étienne Balsan’s (her lover and financial sponsor) salon that catered to the French hunting and sporting elite. Naturally, she rubbed elbows with the upper class and was exposed to their fashion tastes. She eventually befriended Arther “Boy” Capel who was a friend of Étienne and became his mistress thereafter. He saw her talent and financed her first fully independent business venture, Chanel Modes, in Paris, France. Due to permit restrictions, she could only sell hats at first and had to stay out of the clothing design side of the business. Within two years though, Chanel was able to make her entry into clothing and started selling designs that were functional and allowed women to play sports. With the pressures of World War I in place, Chanel’s shop delivered clothing designs that were functional and flattering to women’s bodies. She designed elegant but simple nightwear that contrasted with the over-the-top fashion of the 19th century. By the 1920s, the flapper movement was in full swing and she rode this trend as it was a natural fit for her designs that accentuated women’s’ needs for empowering clothing. Chanel found unexpected success in a complimentary industry after developing a perfume as a gift for clients. This perfume is the famous Chanel No. 5. Chanel saw strong growth due to this new line of products. Growth was not always easy for Chanel though. With World War II, Gabrielle Chanel experienced all sorts of turmoil. She had a German lover and there were rumors of her being a Nazi spy. She dealt with rifts within the company and after the war struggled to retain control over her company’s earnings as new business partners came in along with a forced move to Switzerland. Despite her personal struggles, the Chanel company grew into one of the most valuable brands in the world. It eventually expanded into several areas of women’s fashion like handbags, cosmetics, and fragrances. Chanel associated its products with celebrities and fashion icons. It even arbitrarily restricted where it would sell Chanel No. 5 to create a sense of scarcity while pouring millions of dollars into advertising to drive up demand. This strategy worked as Chanel commands around $200 per ounce for its fragrances. Chanel is able to charge similarly high rates on its other clothing products dresses costing around $11,000 and handbags at $2,000. Even after Gabrielle Chanel’s death, the subsequent leaders of Chanel have meticulously crafted Chanel’s brand image to ensure it has one of the highest perceived values in the world. It is currently valued at $8 billion. The double C Chanel logo was designed by Gabrielle Channel in 1925. The logo is associated with wealth, prestige, and class. Despite this association, there is nothing inherent about this logo that makes it represent it. All of the meaning and association comes from Chanel products frequently being found on the rich and famous of the world. From a technical standpoint, the logo is easy to recognize and works well no matter what its displayed on, large or small. Knowing though that Chanel often focused on simpler, functional designs for women it makes sense that she would design a minimalistic logo like this to reflect that aspect about her brand. 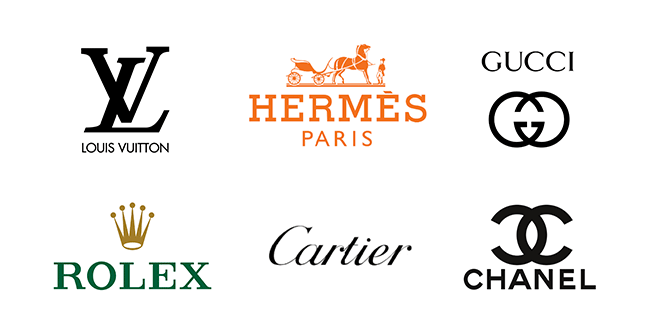 Each of these top fashion brands has a unique story and grew in their own particular way. Some have humble beginnings and others were graced from the start with connections to royalty and wealth. Despite those differences, the common trend that connects them all is that they all have focused on providing amazing value to their customers. Some have achieved it through engineering feats. Another set zigged when everyone zagged. The important thing is that they found a way to bring unique value to their customers. Their brand names and logos in many ways are unremarkable by themselves. Many are named after their founders and have very simplistic logo designs with little or no emotional associations. If you remember from, “How-To Create an Amazing Brand Name”, there is a hierarchy of brand name types. The ones with the most chance for sticking in the mind are expressive brand names that are unique sounding and can be associated with a great emotional meaning. The least memorable tend to be brand names based on founders. However, these examples have shown that connections to wealth, power, and solid competitive advantages can overcome what we consider branding best practices in the modern age. If I were to compare these classic brand names to some of the most popular, modern tech brands in the world today we’d see a totally different style of brand names. The key takeaway from this lesson is that while a company can succeed without the best brand name type, one can make the job of the customer remembering your name and associating it with positive meaning easier by putting a good effort into the branding strategy early on in a company’s growth cycle.